Cemeteries offer a heady mix of history, beauty, nature and death to those who enjoy browsing around them. Burial grounds such as Highgate in north London, which host the graves of the rich and famous, draw thousands of visitors. But there are scores of other less well known but interesting graves around England. In 1703, Hannah Twynnoy became Britain's first recorded victim of a tiger. She was a barmaid at the White Lion in Malmesbury, Wiltshire, when a travelling menagerie set up in the pub's large rear yard, ready to attract paying crowds. Hannah was warned against upsetting the tiger but she enjoyed bothering and poking at the big cat - until one day it discovered the cage door was open. Fed up of the pesky barmaid, the tiger launched itself on the unfortunate servant and mauled her to death. William Walker was a deep-sea diver who, in 1905, was employed to help repair the foundations of Winchester Cathedral. Large cracks had appeared in the cathedral's walls and vaulted ceilings, some of which were wide enough for owls to roost in. Because Winchester has a high underlying water table and the cathedral is built on peaty soil, trenches dug below filled with water before any reinforcing work could be done. So Walker, who usually worked at Portsmouth dockyard, was recruited. A tunnel was excavated beneath the building and for six years he spent nearly six hours a day underwater, in darkness, replacing and shoring up the foundations with his bare hands. He worked entirely by touch. Eventually he propped the cathedral up with 900,000 bricks, 114,900 concrete blocks and 25,800 bags of cement. Because it took him so long to put on and take off his heavy diving suit, when he stopped for a break he would just take off his helmet in order to eat his lunch and smoke his pipe. As if that was not enough effort, each weekend he cycled 150 miles - home to Croydon, south London, before returning to work on Monday. He died aged 49 during the Spanish flu epidemic of 1918. His grave, at Beckenham Cemetery in Bromley, south-east London, bears the words: "The diver who with his own hands saved Winchester Cathedral." In Winchester, there is a grave which pays homage to a 26-year-old grenadier in the North Regiment of the Hants Militia. Thomas Thetcher died after drinking contaminated small (weak) beer when he was hot. Before the invention of modern sanitation, people would drink small beer when fresh water was unavailable. This was because the alcohol was toxic to water-borne pathogens. However, it was not enough to prevent Thetcher catching a fever and dying. And when ye're hot drink strong or none at all. In 1918, the tombstone caught the attention of a young American soldier called Bill Wilson, who was camped nearby with his US Army unit. Twenty-one years later, following a battle with alcoholism, he founded Alcoholics Anonymous and in 1939 published a book about his experience. In it he claimed the gravestone had been an "ominous warning which I failed to heed", and printed the first two lines of the verse in the front of his book. However, it appears he misunderstood the headstone, as he missed out the crucial advice about only drinking strong beer. On 12 May - the anniversary of Thetcher's death - people gather at the grave to drink (strong) beer and raise a glass to the grenadier. Peter had been found living alone and naked in a German forest in 1725. He could not talk, and would scamper about on all fours rather than walk. When he was about 12 he was brought to London by King George I where he became a "human pet" at Kensington Palace. However, his inability to learn table manners or speech, hatred of wearing clothes - even his specially-made green velvet suit - and lack of decorum led to him falling out of favour. The court paid for him to retire to a Hertfordshire farm with a generous pension and when he died, aged about 72, the locals paid for a headstone. Even today, flowers are laid on his grave. Peter's funeral was held at St Mary's Church, Northchurch, Hertfordshire, and was paid for by the government. His gravestone was provided by local people. At the time, courtiers assumed Peter's behaviour was the result of being brought up by wolves or bears. However, modern analysis of a portrait suggests Peter had a rare genetic condition known as Pitt-Hopkins Syndrome. St Mary's Church in Hinckley, Leicestershire, is the last resting place of Richard Smith who was killed on 12 April 1727, aged 20. Although his headstone is fairly run-of-the-mill, the story behind his death serves as an abject warning to young men with a fondness for messing about when they should be paying attention. According to the local history club, a recruiting sergeant for the army had come to Hinckley and was singing the praises of taking the King's shilling. Richard, rather than listening, made jokes and quips until the recruiter lost his temper. In a slight overreaction, the soldier gave the crowd an unplanned demonstration in how to use a pike in close quarter combat - and killed Richard. For years there were reports of the headstone appearing red and tradition held the gravestone sweated blood on the anniversary of the murder. However, a more prosaic explanation was suggested by a researcher in 1936. The gravestone used to be positioned under a block of red sandstone and it was thought that the "blood" being sweated may have resulted in water dripping from this block. Nestled among the neat headstones at St Anne's churchyard in Woodplumpton, near Preston, is a boulder marking the grave of Meg Shelton. Known as "the Fylde Hag", she was accused of witchcraft in the late 17th Century. Allegations centred on the fairly tame "stealing milk" and the more-impressive "turning herself into a animal". She was killed in mysterious circumstances when a barrel crushed her against the wall of her cottage. Folklore has it she dug her way out of her grave on more than one occasion. She was eventually buried head down in a narrow shaft so that if she tried to claw her way out she would be heading in the wrong direction - and instead burrow her way to Hell. The boulder was put on top as an extra way of keeping her anchored in the grave. According to legend, if you walk three times around the boulder while chanting "I don't believe in witches", Meg's bony hand will rise from her grave and grasp your ankle. Who was Peter the Wild Boy? 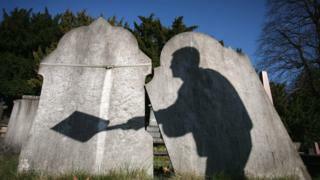 Who, what, why: What can and can't you put on headstones?